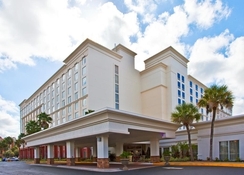 Holiday Inn & Suites across from Universal Orlando is a prime location to explore everything that the area has to offer. Just a short walk to the Universal Studios, this property also provides free transfers to the popular attractions in Orlando. The modern rooms and on-site TGI Friday’s restaurant ensure a comfortable stay and somewhere to relax after a long day at the theme parks. SeaWorld, Walt Disney World and Volcano Bay Water Theme Park are all close by while there are plenty of opportunities for shopping as well. 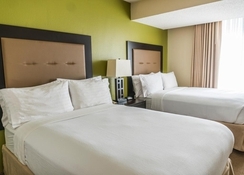 Suited to solo travellers, couples and families as some rooms can sleep up to 10 people, the Holiday Inn & Suites across from Universal Orlando is a great place to explore the rest of Orlando in a modern and relaxed setting. Based right beside Universal Studios, this property is perfect for anyone who intends to enjoy the many theme parks and main tourist attractions in the heart of Orlando. Islands of Adventure and Universal Studios are within 10 minutes of the accommodation while SeaWorld (4.7 miles), Walt Disney World (8.5 miles) and the Florida Mall (4.3 miles) are all close by too. Avid golfers can play on the Orange Tree Golf Course that is just 2.7 miles away and shoppers have an abundance of options including the Belz Factory Outlet Mall and World Shopping Center which are less than a mile away. 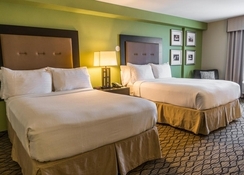 Holiday Inn & Suites across from Universal Orlando has 390 smoke-free rooms and 11 room types that can sleep between 2 and 10 people. There are also rooms for disability access. 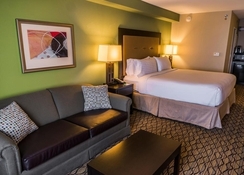 Standard rooms, Deluxe Rooms and King Suites sleep 2 people while there are rooms that features extra double beds and sofa beds for bigger groups. All rooms come with WiFi access, tea and coffee making facilities, air conditioning while the suites have small kitchen areas. There is an on-site TGI Fridays and bar that serves breakfast, lunch and dinner while there are loads of eateries and bars in the surrounding area. 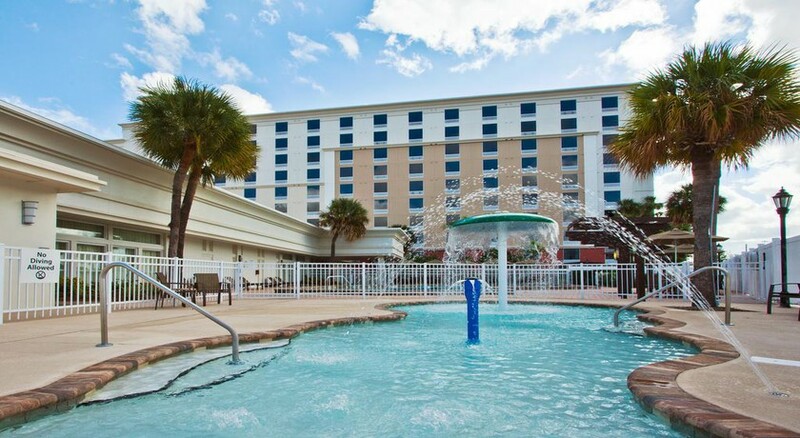 Hard Rock Orlando is less than a mile from the property and there are countless restaurants, bars and cafes on International Drive which is just over a mile away too. 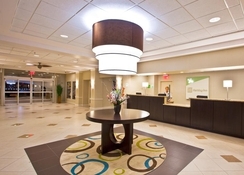 The Holiday Inn & Suites across from Universal Orlando is in a perfect location to access all the theme parks and major attractions in Orlando. There is a free theme park shuttle that will take you for a busy day exploring Universal Studios and Walt Disney World. 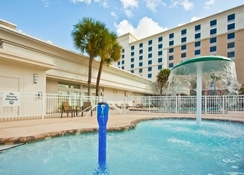 The hotel itself has an arcade game room, outdoor pool and 24-hour fitness centre. Golfers can also get a round in at the Orange Tree Golf Course which is near to the resort. We could have saved money on taxis if we were given information about UBER. Some saff don't know about coach operations to the parks. Coaches come and go whilst people are waiting inside.